Want kitchen design ideas? Here are u-shaped kitchens in black and white. If you want to achieve a classy and sophisticated look – whether this be in your fashion style or in your home design- choosing the black and white combination never gets old. When you want to have that simple yet fantastic look, this combo will always be a great go-to! If you check the internet for black and white stuff, you’ll be seeing the best stuff there is – just imagine a panda and it feels like you have it all. I might have blabbered a lot there, but I’m pretty sure that you get my point guys. 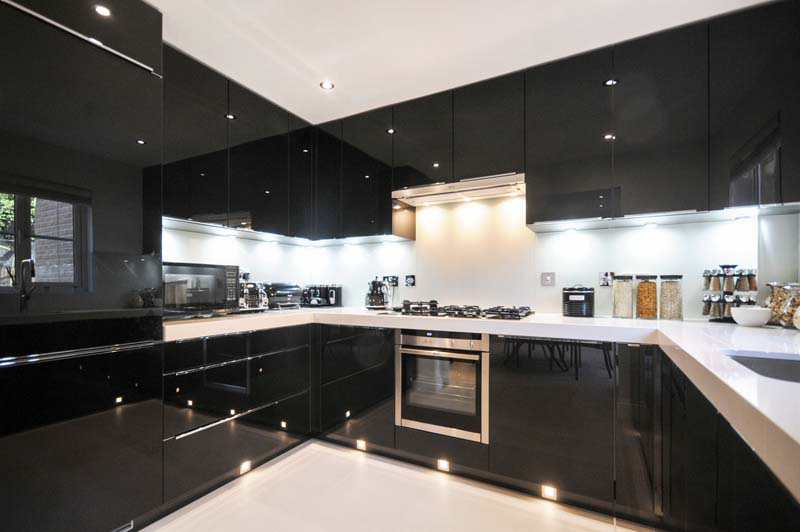 Today, we will be showing you a list of 24 Stylish Black and White U-Shaped Kitchen layouts which I think is fabulous and definitely a great option when you are choosing what layout to pick. Check out the list below and tell us your favorite! 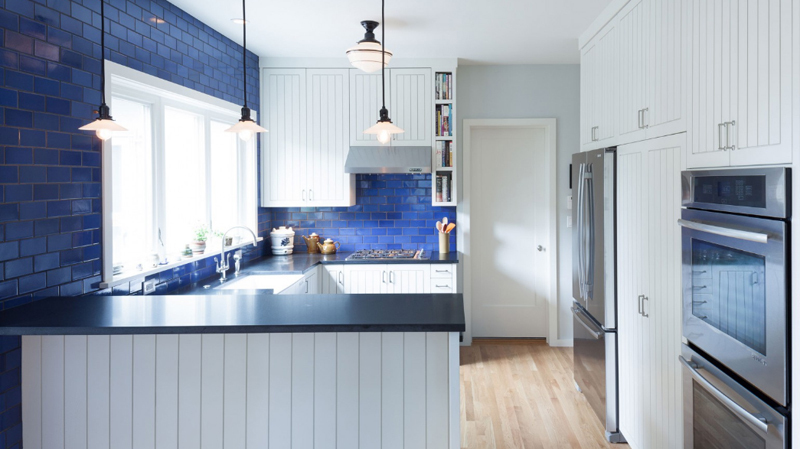 This beautiful Portland kitchen sure exemplifies what we should be expecting in this list. 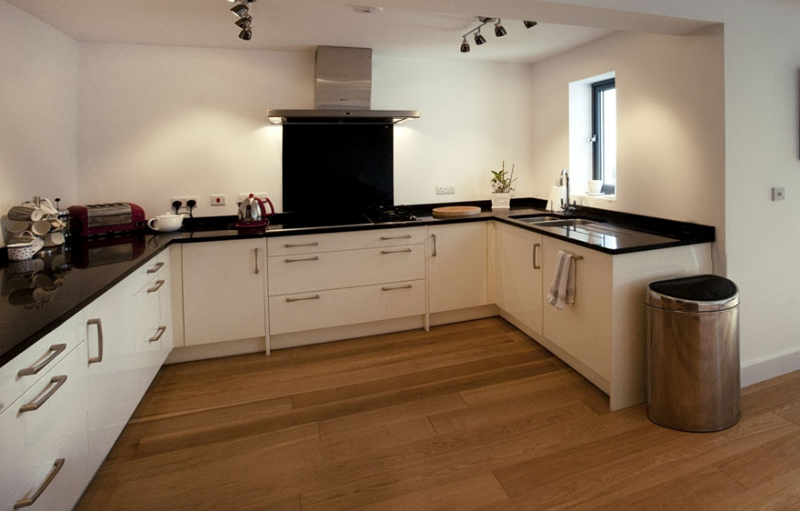 A standard U-shaped kitchen layout with hints of black and white in the materials used with it and with the room itself. 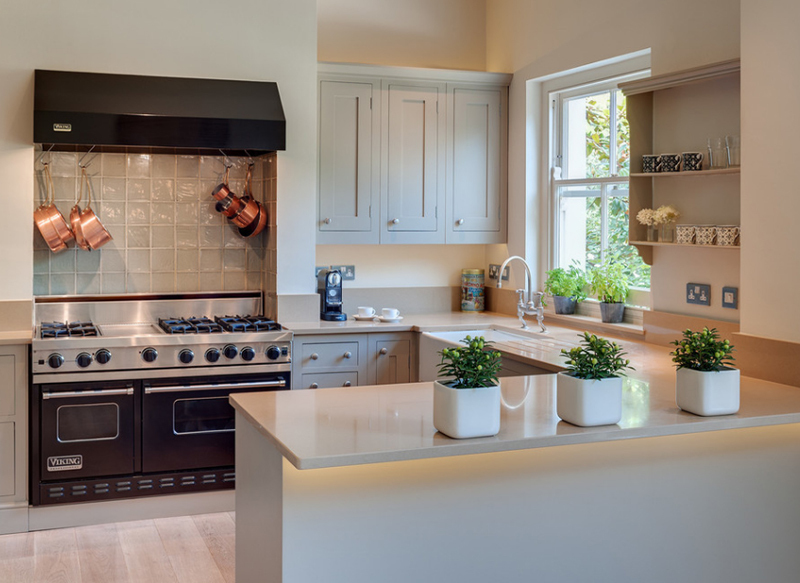 Personally, I think that the traditional style of the kitchen cabinets and drawers in this kitchen is just beautifully crafted to fit the style and need of the client. This lovely kitchen area is just perfect for those small meals that you’d be preparing like for breakfast or for snacks. The home owners would easily be able to whip up a neat breakfast for one another and enjoy it in this very kitchen without the need to really go to the dining area. 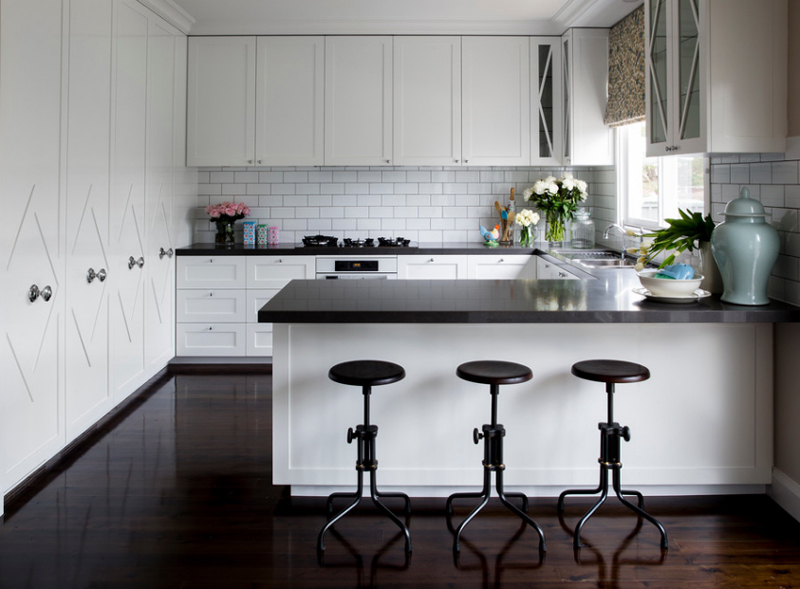 Adding stools in kitchens add to the inviting part of the food preparation. I think that the gas ranges in here with that exhaust and bronze pans is just stunning! I have been enjoying going to appliance stores because I love seeing the beautiful range available right now in the market. I’m a home baker with a table top oven and seeing ranges like this one makes my heart skip a beat! Tell me what you think about this kitchen? Aside from its evidently beautiful pendant lamps and kitchen furniture? The layout is very common and traditional, but very helpful and convenient for the most part. Aside from the L-shape layout, the U-shape layout is just as useful and smart. For a moment there, I thought that I lost the reference and link to this beautiful kitchen. 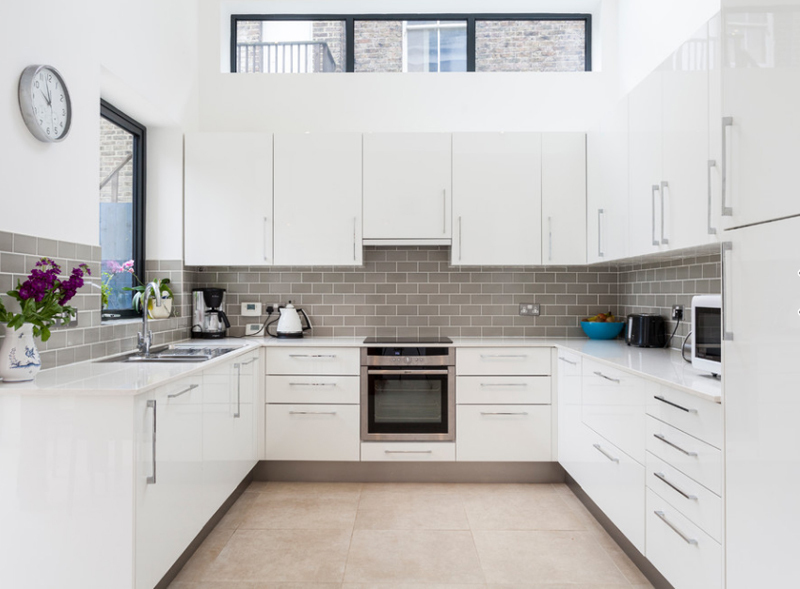 This elongated kitchen surely maximized the space that has been given. 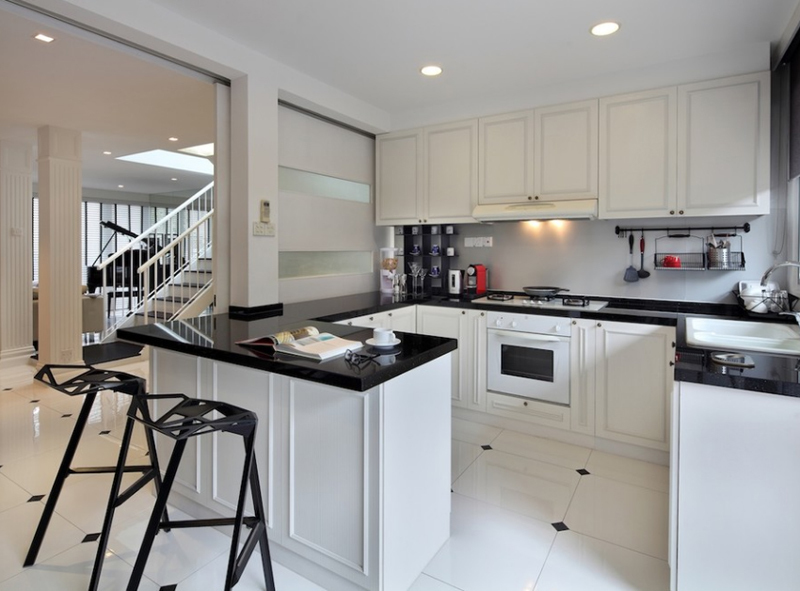 In as much as the minimum requirements for kitchen spaces were met, this space surely showed us how to rock a black and white U-shaped kitchen layout. 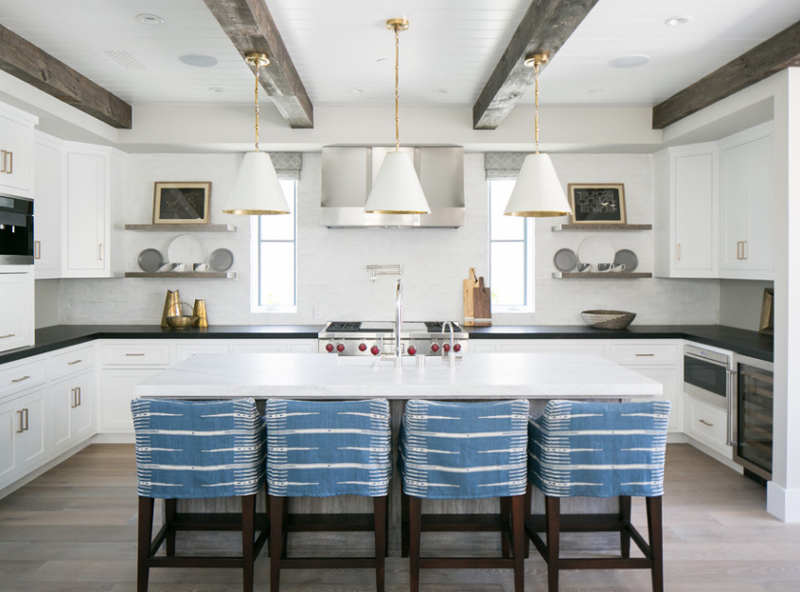 I wish that this kitchen has a bit more whites than just its countertop really – I mean, this kitchen is just stunning and even pronouncedly perfect; but then again, I think kitchen spaces should be more lighter and maybe whiter because it’s the kitchen. This space is really sophisticated and classy because of the materials and whatnot, but I feel that it’s quite dark and spooky – especially at night (at least I think so). Now this is one glossy kitchen! 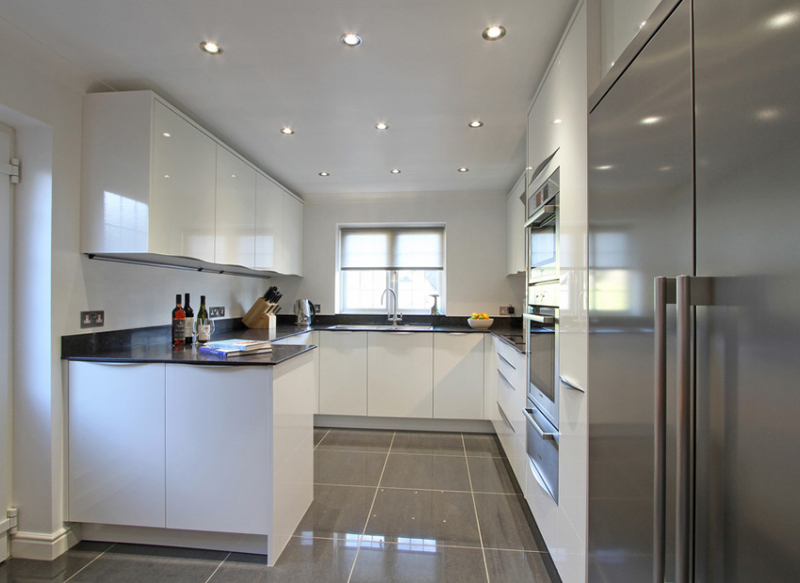 Ebstone Kitchens sure has a wide range of kitchen spaces that you can go ahead and check. I personally perused the entire website and this is by far one of the prettiest in the bunch. 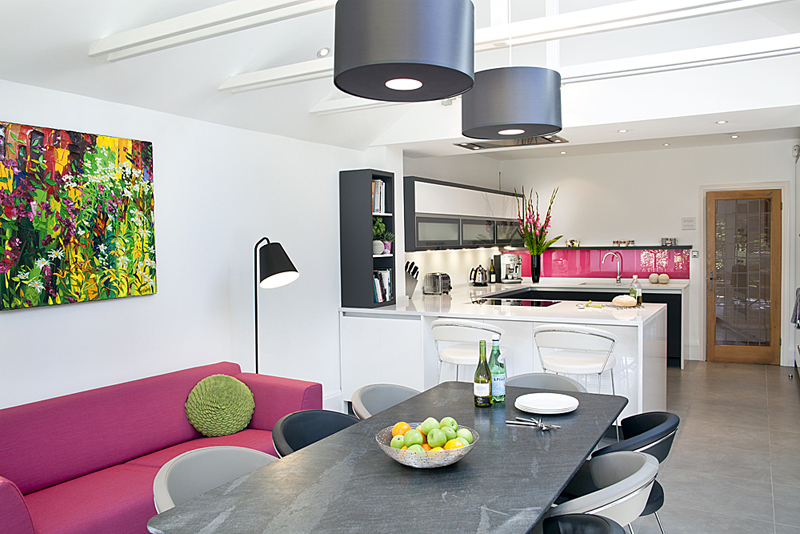 The glossy and stylish cabinets and drawers tell us so much as to the users of this house. Do you agree? The kitchen stools seen in this cute kitchen is quite something. As is something interesting and new. It’s not really everyday that you’d be able to see chair designs like this one – so new and unique. The kitchen looks real simple and yet still being able to function well as it is. What do you actually think about this kitchen? I know that the black and white them is pretty minimal in here but we see that though right? 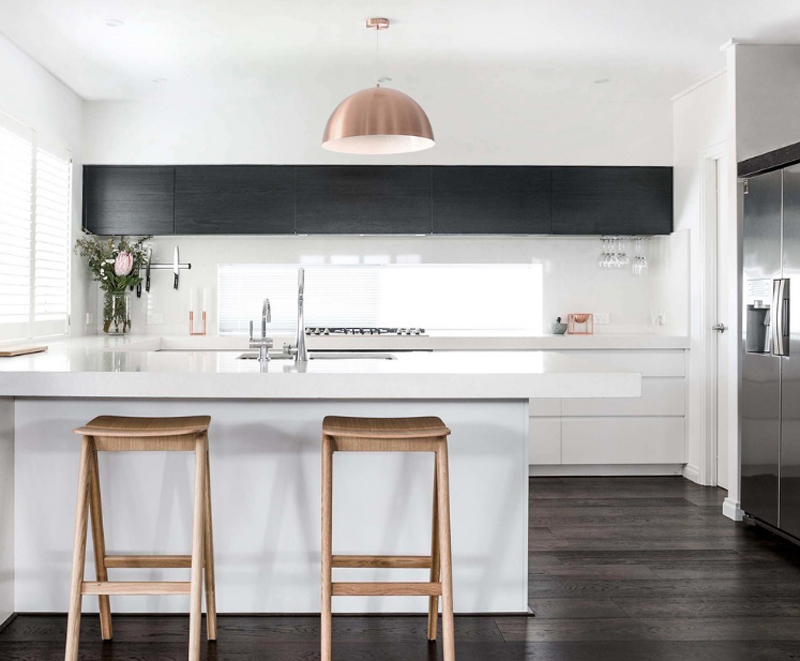 The countertop and cabinetry work in here contrast in that manner and I think it’s both lovely with a hint of contradiction for me when they added a grey island – but then again, grey always go well with black and white. Well, this kitchen sure was made by Clean designers. Pun intended. 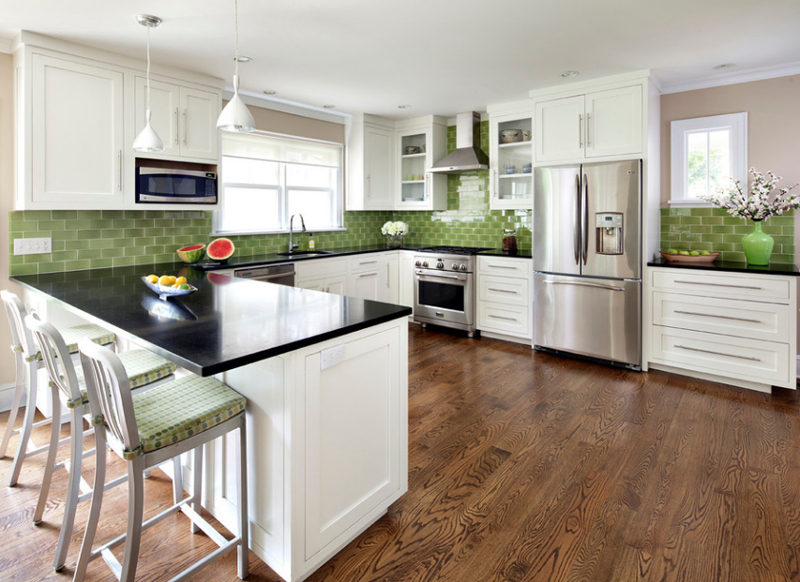 I love the way that they incorporated the green tiles with the black and white combination of the countertop and the cabinet work. The brown flooring adds to this already fascinating treat that the designers did for this space. At first, when I added this photo to the list I was collecting, I added this at the L-shaped kitchen – when I was already ready for editing and all that, I saw that this was actually a U-shaped layout. So, anyway, I think that this kitchen needed to be shared with you guys just because of the pretty pink detailing it has. The stunning bronze drum pendant lamp in here is just perfect! Its color somehow is similar with the color of the wooden stools which looks real good, actually. 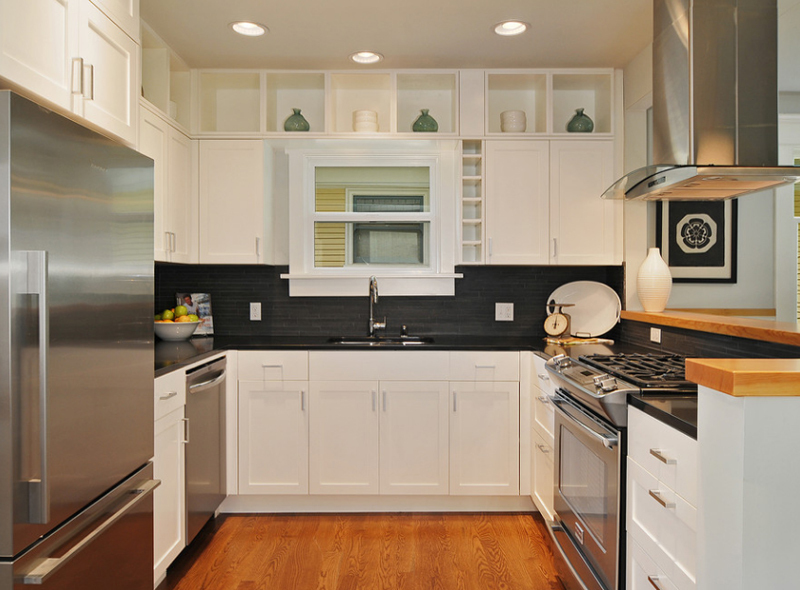 The black cabinets above the white countertop are pretty neat too, I should say. Do you like it though? The rustic feel to the outside area of this kitchen is interesting. If you might notice, this U-shaped layout looks like a kitchen island because it is in the middle of the room while the kitchen range is in its outskirt part. Wow! I think that I might just have used that word wrong; but I think you get my point, right? This is actually the first photo that I got when I was collecting for this list. I know that the black part is basically at the window sills and all, and I apologize, but I think that this kitchen is just beautiful not to be shared with you guys! The lighting in this kitchen is just magically done. As much as I think that this photo is processed to look like this, I think it actually works. We see very minimal black in this kitchen but I think what little black it has is compensated with the beautiful white cabinet work. 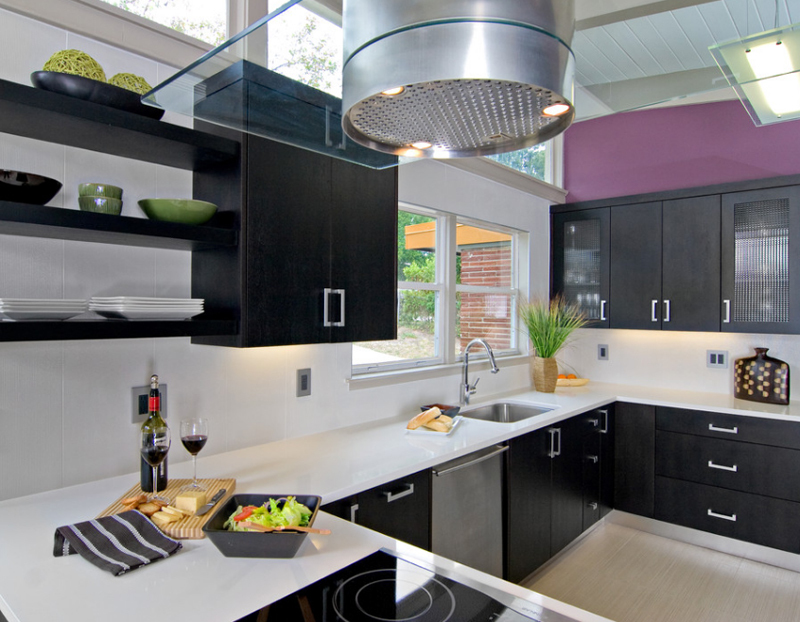 However neat a black and white kitchen look like, some clients or designers just can’t wait to add a bit of coolness or pizzazz in their designs – just like the hint of purple they added above the black cabinets which I think works and is just making this kitchen irresistible! 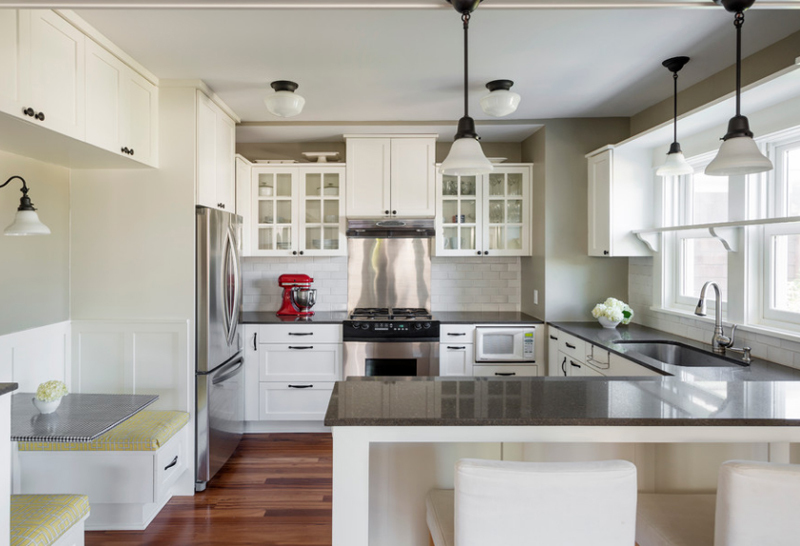 This kitchen design has easily maximized a semi-limited space through the use of multiple drawers for storage purposes and a counter in the middle that can serve multiple purposes. 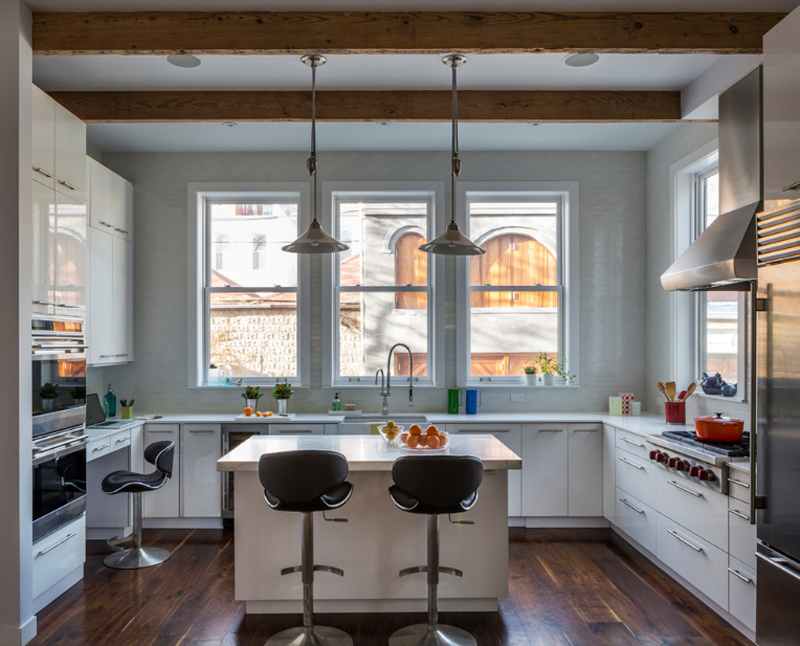 Not to mention, the wide open windows is a pleasant thing to consider when constructing your kitchen. This kitchen has a more limited space than the previous one but similarly, they have maximized the entire area by using good storage ideas through cabinets and drawers. The decor is limited but they add a nice effect to the whole look. 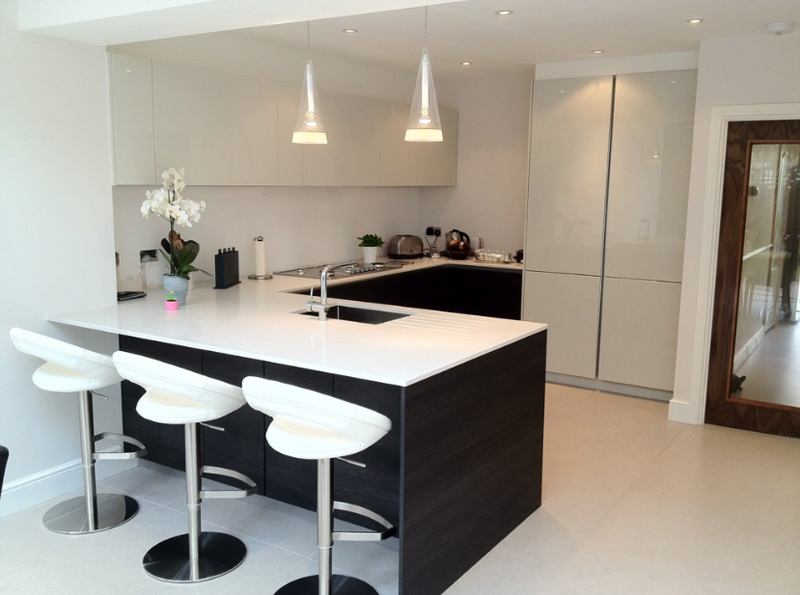 This kitchen looks very modern and with the color choice, the whole effect is very clean and tranquil. This kitchen is perfect for those who are looking for possible ideas for their bachelor’s pad or newly purchased condo unit. Cooking options might be limited but if you are looking for straightforward ideas, this might be a good consideration. This kitchen idea offers new possibilities. If you love cooking and want everything to be clean and organized, this kitchen right here is a good model. I love how this kitchen incorporates practicality but also style. I appreciate the small dining space at the corner as well as the countertop where intimate dining experiences are a possibility. 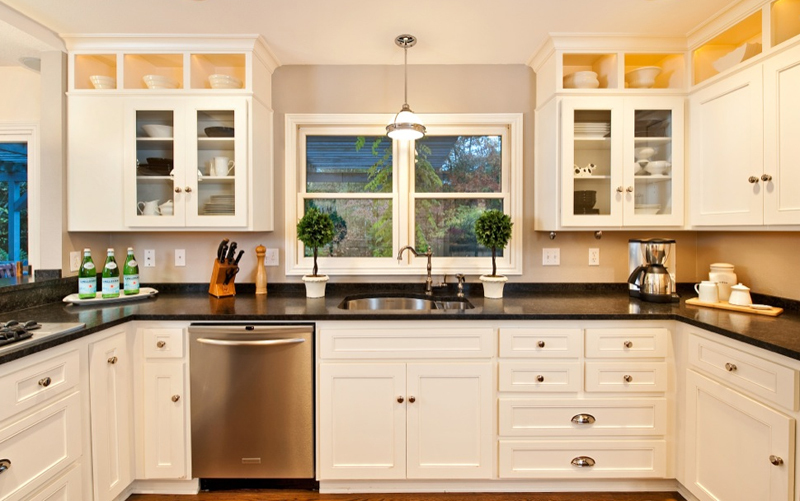 Very chic and charming, here is a modern-styled kitchen perfect for the home cook who loves clean and organized cooking. This area is definitely something you can boast and take pride in especially when having friends over and cooking them some dinner. 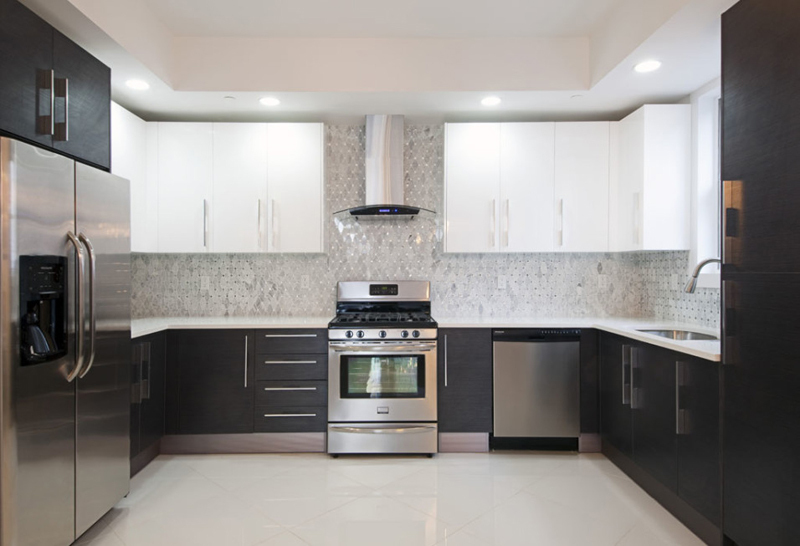 Black and white kitchens really look great with stainless equipment. The blending of silvery grey with black and white makes the whole look clean, modern, and very posh. If I were to associate this kitchen with a home cook or chef, this is perfect for a male cook who wants everything in style but still appear manly. Definitely this is a design to consider. Some kitchens do away with cabinets and drawers with handle because if we are talking kitchen, we want just as much storage as we could possibly have. There might be a tad too many handles in this particular kitchen but we cannot definitely go wrong with enough storage space. And also, this has quite a wide floor space for foot traffic. 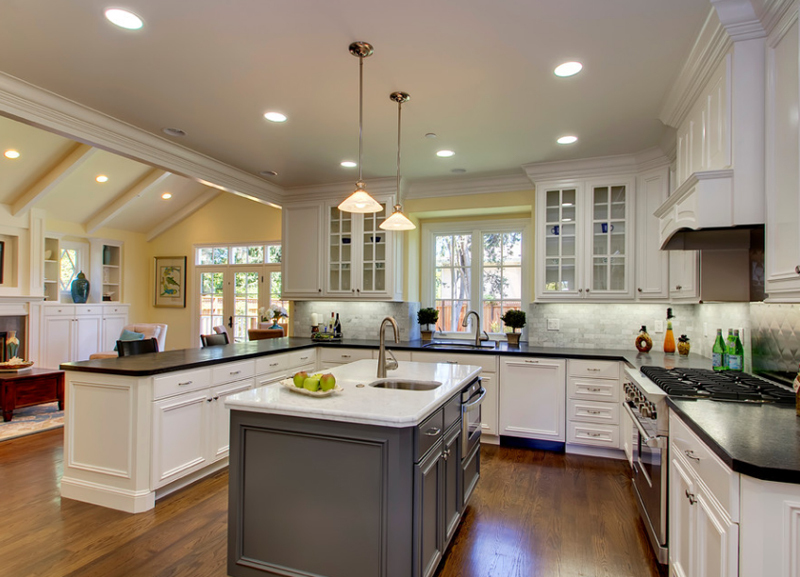 This is a very gorgeous kitchen! The blue brick wall has a nice hue and it goes perfectly with the white wood in side. The panel boards are a cute option when deciding the style of the cabinets. 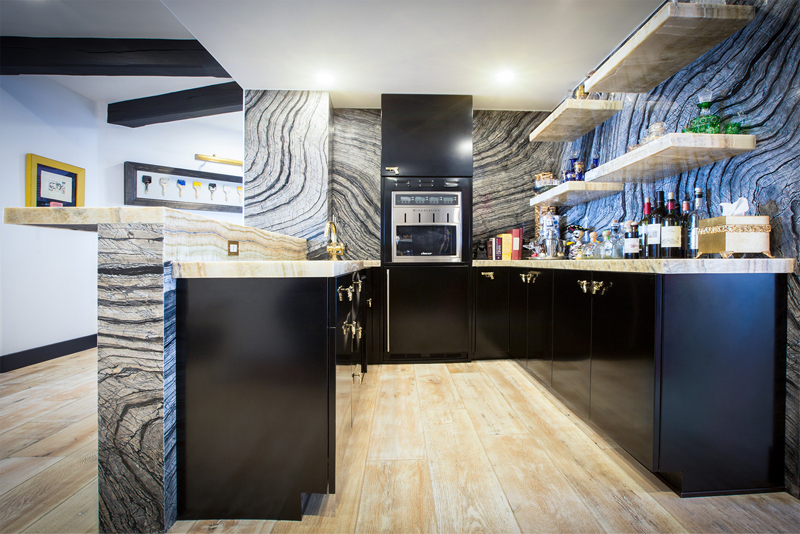 The black counter top offers a contrast to the white and blue motif but again, it just makes the whole look a lot more stunning! I sure hope to have given you a good glimpse of what limitless possibilities and potential your kitchen may unlock. 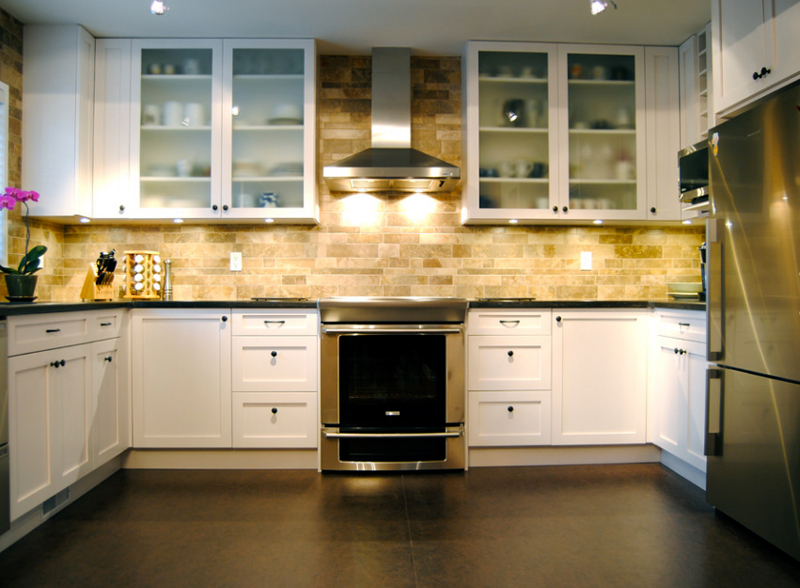 There are several option out there and I hope you saw what you might just be looking for or thinking about for your kitchen. 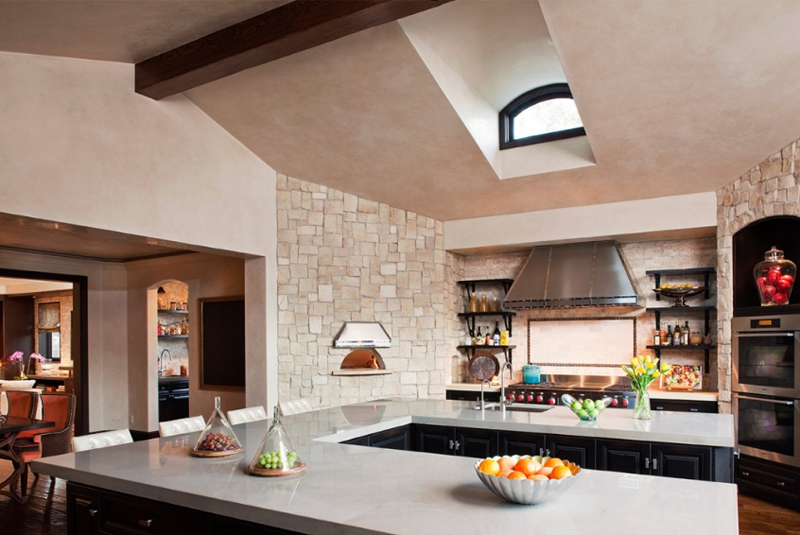 For more ideas for your U-shaped kitchen, take a look at these17 Beautiful Contemporary U-Shaped Kitchen Layouts.